There is not a meat-eating or Paleo enthusiast alive, who does not adore sausages, it just cannot be so. Sausages are a perfect food for eating on their own, next to a loaded sweet potato or served with freshly chopped onions and bell peppers. More recently, as we have just found out, sausages are also fabulous when cooked in a hot skillet with onions, mushrooms and seared apples with a little chicken stock and white wine vinegar to boot. It is a dish that will be made time and time again, for the flavor is as superior, as the kind of sausage you include in the pan. 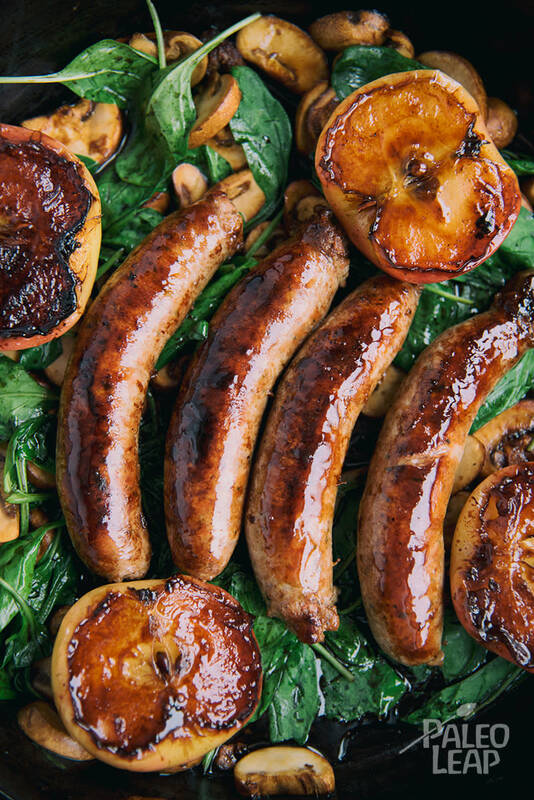 Sausage and apples are kid-friendly as well – keep that in mind for any cave-baby invited to lunch or dinner. The big dilemma about sausages is not in the ground meat that goes into them, rather it is in the preservatives and fillers – the bulking agents that make up many modern foods. If you aren’t able to make them on your own (how many of us have time for that anyway? ), you’ll have to read labels carefully and find the closest to natural possible. Start your search for sausages with natural casings, avoiding plastic at all costs. You’ll find that the best tasting sausages do not contain any gums, wheat or vegetable protein as filler. If you’re following an Autoimmune Protocol, sausages can still be on your plate! Look for the spices added, or make your own with some ground meat and seasonings, like these breakfast pork sausages – minus the paprika. This meal will not disappoint for breakfast, lunch, or dinner. Heat the cooking fat in a skillet over medium-high heat. Add the apples cut side down. Pan sear, turning occasionally until golden brown, about 5 to 6 minutes. Add the sausages, onion, and mushrooms to the skillet with the apples. Cook, turning occasionally, about 8 to 10 minutes. Pour in the chicken stock and white wine vinegar, whisk while making sure to scrape the bottom of the skillet. Cook for 4 to 5 minutes. Add the spinach and cook 2 to 3 minutes, or until wilted, and serve immediately.